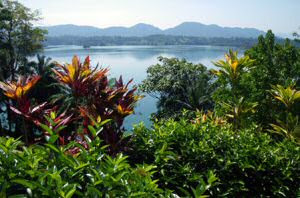 My daily massage at the Lake Kenyir Resort and Spa (Ulik Mayang Spa) only costs RM70 or about $20. It's great to rejuvenate yourself in a place in Malaysia where temperatures are cool and you are surrounded by lots of water and nature. 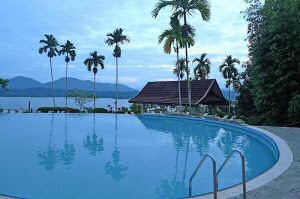 Do book your chalet at the Lake Kenyir resort and spa with a view towards the lake! That's the best way to enjoy anything relaxing, or typing this post like I do. I will have to go to the resort's lobby or restaurant to get connected to the Internet though, it would just be a little extra effort for the resort to get us an Internet connection in the Chalets. It's the small things that count I would say. Lovely infinity pool at the Lake Kenyir Resort: make sure to bring your bikini and chill out in the bar after a swim.Sun tan lotion can be bought in the shop of the resort. Choice of food is plentiful, yet the taste could be better when it comes to local food. Quite some variety of western food as well, which I will never understand; why you want to eat western food when you are in Malaysia: the melting pot of Asian cuisine? Good service though and you just need to call and a golf cart will pick you up from your Chalet to where you want to go on the premises. Peak season for this resort is June, July and August. And since it is easy accessible, lots of local Malaysians spend their weekend here. So for a relaxing Resort and Spa holiday at Lake Kenyir, come during the week (just avoid monsoon season: November and December).